Jomtien Complex welcomed it's newest Bar on Saturday, April 23 - The Pour House. 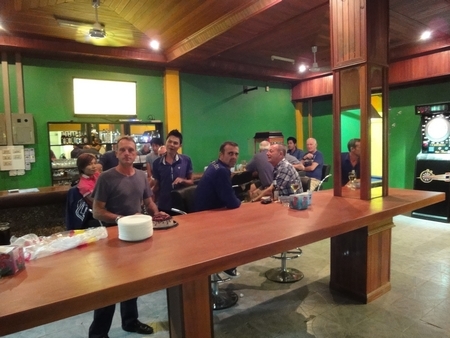 Located across the street from Ganymede Bar & Residence, The Pour House promises to be a great new watering hole for ex-pats and visitors alike. While the Pour House is a Gay Bar, it is not a "Boy Bar". Think of it more as a place where you can meet up with friends, or even take your Boyfriend to, without feeling pressured into buying the staff "boy drinks". While the official Grand Opening Party is still weeks away, The Pour House is open for business with a friendly, smiling staff, good drink prices, a large 50" TV above the bar, Pool Table, Popcorn Machine, Electronic Dart Board and comfortable seating. 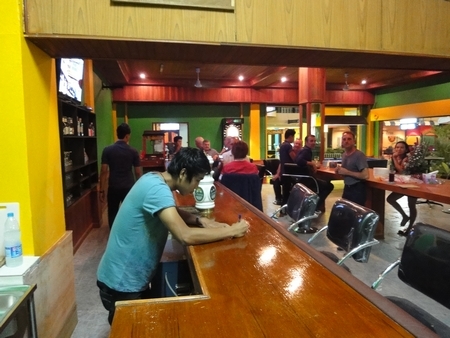 The Bar Opens daily from 5pm. In the coming days, the Terrace Bar will open, a stage for shows will be built and regular events nights will be announced. The Long Bar is proving to be a very popular spot to "belly up" as is the newly built community table in the room's center. The decor is Green & Gold with beautiful wood ceiling and trim work. 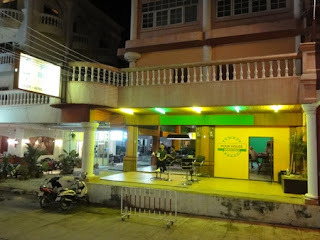 While not air conditioned, the numerous ceiling fans kept the place quite comfortable even on a hot, muggy April night. The Drink menu currently is basic - Beer (Draft & Bottle), House Red & White Wine, Mixed Drinks and soft drinks - this is not a Martini Bar and doesn't pretend to be. Happy Hour Specials on Draft Beer (By the glass or Pitcher) are available from 5pm - 8pm daily. Of course, the Popcorn is free!! While other areas have seen a downturn it business (and closings), Jomtien Complex has seen a resurgence of late with quite a number of new establishments opening in the past few months (Spilia Karaoke, Themae Sauna, QM Bar, Pattaya Hotmale, Pour House). Even more gay owned businsses are opening soon. 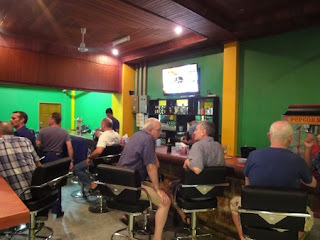 The great thing about Jomtien Complex is that it offers you not only a very diverse Bar scene -, you can find a variety of great places to eat, accommodations (at reasonable prices) and it's only a five minute walk from the world famous Gay Beach. 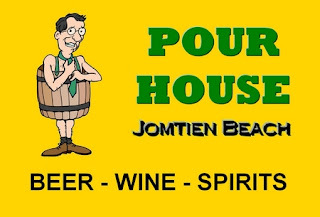 So the next time you are in Jomtien Beach, take a stroll down to "The Pour House" in Jomtien Complex, you'll find it will be a "rich" experience.